Amazing Ocean Front Luxury Villa. Great Location. 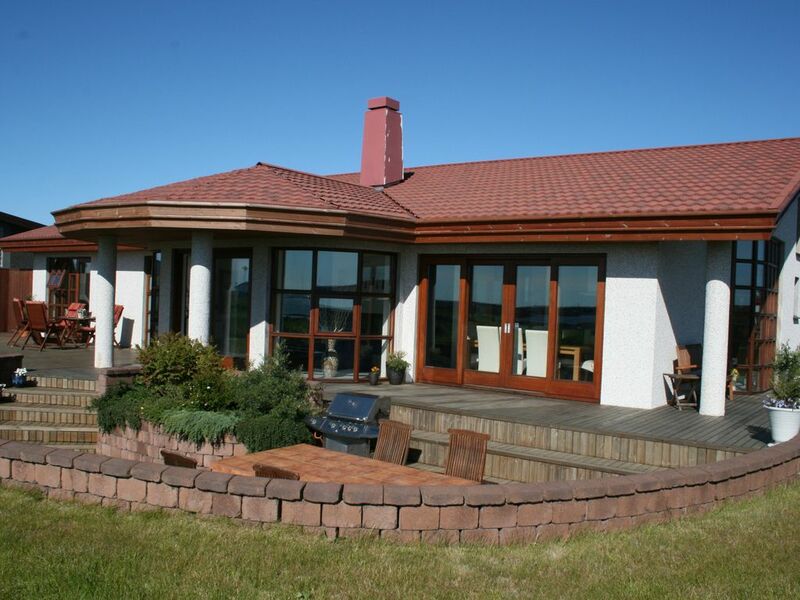 The villa is a modern, luxury 200 m2 house in the village of Vogar which is only 35 minutes drive from Reykjavik, 15 minutes from Keflavik International Airport, 15 minutes from The Blue Lagoon and an hour drive to The Golden Circle. The villa has a panorama view of the ocean. It includes three bedrooms; one with a King size bed and two rooms with Queen size beds. The garden has a large patio facing the ocean with a fire place, a large barbecue grill, garden furniture and a hot tub for 5 people. There is a short walk from the patio down to the ocean. A golf course is 8 min drive away as well as three other golf courses within 30 min drive. Check in is at 3 PM and check out is at 10 AM. My family and I have lived in Vogar for the past 23 years. We build this house ourselves in 2001-2003. I work in the building industry as a finance manager and my husband works as a project manager in the same company. When we made the decision to build our house we were determined to be close to the ocean. The location we found is just perfect, only a a few steps from the house to the water with a breathtaking panorama view of the ocean. The outside hot tub is an excellent place to relax and enjoy the views as well as the beautiful northern lights during winter time. We love the location of our house, being so close to the ocean and away from the hustle and bustle of a big city. The whole west side of the house has huge windows facing the ocean so nothing hinders the amazing views. In the evenings the water is calm and beautiful. It´s a great place to catch the northern lights in winter time. Sliding doors on the west side of the house on to the terrace overlooking the bay. Panorama view to the ocean from the master bedroom window. Panorama view to the ocean, only 20 meters to the coast line. iMac computer connected to the internet for your use. Free wireless internet connection. My webpage www.villarent.is has good information´s about travelling in Iceland. Fireplace outside on the patio. Paper towels, olive oil, salt and pepper, cleaning liquids, baking material, coffee and tea. Dishes and utensils for 9 people. Dining table and chairs for 8 people. Leisure room with Barbie dolls and Legos. 1 hour drive. Depending on the weather, usually open from November to April. The villa is on one floor. There are two steps down to the leisure room - Lego Land. Most wonderful holiday/birthdays - host lovely, home to die for, run to Costco easy, quick access to all the world adventures! We stayed with two toddlers in December. The house is beautiful and I’ve recommended it to all our friends. The kids loved the tv lounge area and all the toys and we loved the hot tub and the fireplace on an evening. The location was perfect for families as it’s still close to amenities. We did the golden circle ourselves and we Went to the blue lagoon. We didn’t see the northern lights as they weren’t very active and it was quite cloudy but I do wonder if the light pollution might play a factor also. Previously I’ve stayed in a rural house and we saw them every night, if that’s an important part of the trip maybe go more rural... but that’s only our experience. Having little ones we couldn’t drive out on an evening. My family and myself use HomeAway whenever we travel and our stay here was awesome! It was a perfect spot both for experiencing Iceland and to share good times. We loved the property and the location. Beautiful home with a spectacular view! This is an exceptional property. The owner has decorated with comfort and artistic flair! It is conveniently located within 20 minutes of Keflavik Airport making our early morning departure very easy. In addition, it was within 30- 40 minutes of all the things we wanted to see and do in Reykjavik. We were a three generation family visiting Iceland for the first time and found our experience to be very positive. Owner, Johanna, greeted us upon our arrival and gave us a tour of the property explaining how everything operated and showing us all the special features. A very thorough notebook was on the property to answer any further questions that we might have. The kitchen was well equipped including coffee, condiments, spices and basics, so we didn't need to purchase some of the items at the grocery. Comfortable beds, a lovely fireplace, beautiful sunsets across the waterfront and a warm hot tub made this home a perfect retreat each evening after our days of touring and visiting this incredible country. The layout of the home was great for families with multiple areas to relax, individually or as a group. The children loved the large Lego collection and exploring on the beach when the tide was out. The paved walking path along the waterfront was enjoyed by all. This is a wonderful house and property!!! Every detail is thought of, the host is fantastic! Linens and bath towels are included. Daily housekeeping or cleaning over your rental days is NOT included. Cleaning after your stay is in the rental rate.